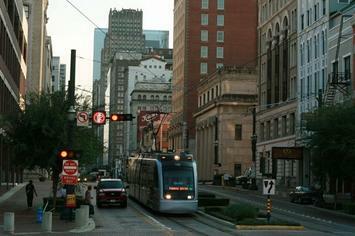 There is an effective lobby for building light rail, including in cities such as Houston. But why build light rail? To reduce car use? To improve mobility for low-income citizens? This certainly seems a worthwhile objective, with the thousands of core-city, low-income residents whose transit service cannot get them to most jobs in a reasonable period of time. ut rather than accept the flackery that accompanies these projects, maybe we should focus on effectiveness, judged by ridership, and the impact of such expensive projects on the transportation of the transit-dependent. Take the Dallas light rail system, which serves growing Dallas and Collin counties. The DART light rail system expanded its lines by approximately three quarters between 2000 and 2013, yet the number of transit commuters declined, and transit's commuting market share dropped by one-quarter. More than twice as many Dallas workers are employed at home than ride transit, and do not require the massive capital and operating subsidies of light rail. Even the widely praised Denver system has barely moved the needle for transit ridership; before opening its massive light rail system in 1990, 4.3 percent of Denver commuters used transit to get to work. The share did rise - by a total of 0.1 percent to 4.4 percent. Even Portland, considered the Mecca of the "smart growth" strategy, actually has seen a decrease in its transit market share, from 7.9 percent before light rail to 6.4 percent in 2013. San Diego, arguably one of the more successful light rail systems, has seen its transit market share stagnate, from 3.3 percent in 1980 before light rail to 3.2 percent in 2013. And then there is Los Angeles, a city that was essentially built around the Pacific Electric "Red Car" system in the early 20th Century, and is the densest in the United States, more than twice as dense as Houston. Yet despite this, the regional MTA, which operates its large bus and rail system, as well as a subway, still struggles to reach its ridership record reached in 1985, when transit consisted of only buses. Despite spending over $10 billion in public funds, Los Angeles has seen ridership decline while the once-more thriving bus system has deteriorated. Nearly three quarters of all Angelenos still drive to work. No surprise then that Houston, where the light rail system opened in 2004, has not been notably successful. Between 2003 and 2014, Harris County's population grew 23 percent, but transit ridership decreased 12 percent, according to American Public Transportation Association data. This means that the average Houstonian took 30 percent fewer trips on the combined bus and light rail system in 2014 than on the bus only system in 2003. Finally, in each of these cities, driving alone has increased and, with the exception of Los Angeles, more people now work at home than ride transit to work. With population and jobs concentrating in the periphery, light rail service ends up serving a geography to which relatively few commute. They have not materially increased transit's share of travel, or reduced car travel. Worse still, their intense expense on single lines (routes) has precluded greater and less costly bus expansions that could have provided neglected communities - the young, the poor, the disabled, immigrants and minorities - with access to more jobs. The performance of light rail simply has not justified the expense. Houston and other metropolitan areas need to take advantage instead of an incipient transportation revolution. Working at home is likely to increase substantially and automated vehicles promise to increase mobility while reducing traffic congestion. Companies like Uber could offer other private-sector based solutions. Houstonians should address the needs of the 21st century city not as some wish it to be but based how things really work. This piece first appeared in the Houston Chronicle. What's the Sun Belt got to do with it? Submitted by Rambler88 on Wed, 10/21/2015 - 23:17. Sure, it can be tough driving here in the winter, but weather that can shut down roads is apt to shut down surface rail as well--especially if the surface rail is designed and run by urban bureaucracies. And many people will still have to drive some miles to the nearest rail station. This points to another important factor that's often overlooked. You can't compare a rail system like New York City's, the core of which is underground, with the light rail systems being proposed today. A largely underground system is highly weatherproof to the extent that it's underground. I lived and rode the subways in New York for decades, and almost no kind of weather stopped the trains, except in the outer reaches where they ran above ground. Also, since stations are much more expensive to build, transit authorities can't put stops on every block in order to sell the system to everyone. So the trains run faster. A lot faster. Light rail makes economic sense only to a few small groups: 1) the big contractors who would build it, and could send in insane bills to states that have little experience costing rail transit; 2) construction unions; and 3) land speculators, since trains, unlike buses, lock in the effects on the real estate market. Those groups make their influence felt though corruption. Corruption is most influential in large cities and in state governments, since the stakes are higher and the opportunities more numerous--there's more to buy and more officials to buy it from, who are less accountable to the public in a large and complex power structure. Ubiquitous, ineradicable corruption is another legacy in those same "legacy cities". But bribing the municipal and state governments to impose and subsidize light rail is probably a realistic goal for special interests in most states with large cities. Once the core cities and the state government are bought, the suburbs don't have a chance unless they form a solid voting bloc with a fairly populous rural-and-small-town hinterland.